The beautiful bikini wearing girl with sun hat on her yacht in the South of France. The girl who lost 20 lbs in one month, without going for a run. Those yoga positions I can’t do. 25-year-olds making $1,000,000 a year from You Tube Ads. Women who have a more successful business than moi. Anyone on any trip anywhere or anyone who can fit into a size 8 (or less). Social Media, News, Gossip, Work, Social Events…are making you angry, frustrated, mad, sad, depressed. There’s an entire whole host of negative emotions that can just “not feel good”. You can barely do anything these days without getting triggered about something. One second you are on top of the world, then BOOM – you are in a heap on the ground. This is life – yes, but even more so now with things splashed in our faces 24/7…. I’m guessing it’s worse in 2018 than any other time in history. 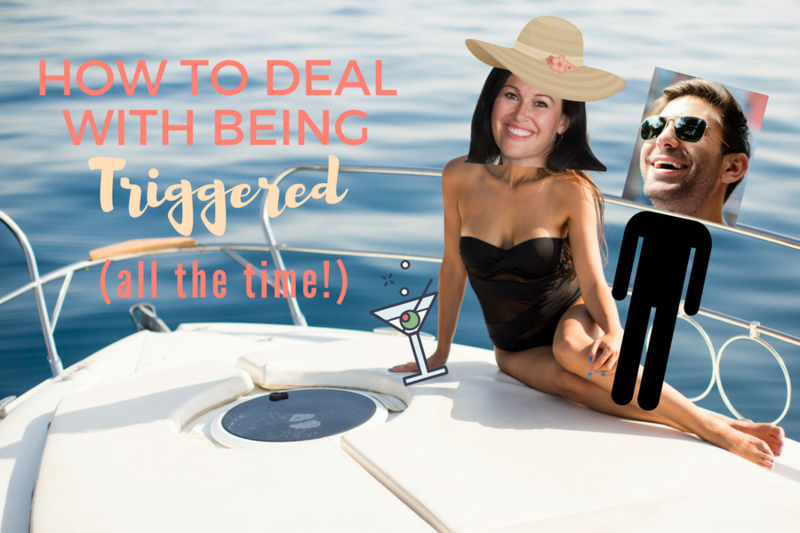 I’m going to walk you through exactly what I do every time something triggers me. I won’t lie. It took work to get to this place. And FAITH, CLARITY & CONFIDENCE. Step 1: You have to recognize what it is that is triggering you. All the gossip you hear is usually something that has someone else triggered. All the gossip you speak – that’s usually nothing more than what’s triggering you. What are you ranting about lately? That’s usually a good indication. Step 2: You have to find a way to take (consistent) action on what you want for your life. If it’s a relationship you want, then go date. If it’s money you want, then go make some sales, pick up the phone, network, get a job, etc. If it’s health/body you want, go for a walk, eat better, or hire a coach, find a better doctor, try alternative treatments, etc. And I’m going to take it one step further (one step more than my FB Live the other day)…. and let’s be clear here’s where the magic happens…. Be thankful to the person who triggered you. The thing is this – without “them” living your dream life it’s impossible for you to have known what’s possible! The fact that they went out and did what you want to do or created what you want to create or have what you want to have is YOUR BIGGEST BLESSING – because without them, if they didn’t exist, you wouldn’t know it was possible for you. They showed up, and in true Law of Attraction form, you saw whatever it was that you needed to see. It’s funny what you DIDN’T notice. If you are happy with your relationship you didn’t see the happy couple. If you are happy with your body size you didn’t see her bikini wearing body. If you are happy with your bank account you didn’t see her yacht. There’s a million things passing by your beautiful eyes every day. Many of them WON’T trigger you. And you are attracted to the things that trigger the BEEP out of you! Your eyes MAGICALLY zero in on all the STUFF you want. This is how it will always work. This is how you are programmed. For increase, to expand, to grow, to stretch, to BE ABUNDANT in all areas. You will be dealing with triggers until you are in the nursing home and some hot babe in their 70’s is stealing your 80+-nursing-home boyfriend from you. Knowing that TRIGGERS are going to be around you till the day you check out, you have to find a way to use them to your advantage. Blessing another person with a note of thanks or a word of gratitude is always the BEST solution. The other thing I do when I’m scrolling on FB or Insta, I will say a blessing to that person – so I may not actually contact them directly. PLUS – here’s what happens when you are doing your best in the area that’s triggering you & you are grateful – you actually stop creating negative emotions within and begin to focus on the fact that you are on your way to allowing/receiving in that area of your life. Or in other words – you are changing your point of attraction – sending out a different signal which will SHIFT you to what it is that you DO want for your life. You may not realize it now, but you are ONE step closer to having everything you desire, but you can’t stay trapped in negative emotion – so shift as FAST as you can out of the trigger or what ever negative emotion you are carrying around with you – so you can get to what you are really after…. No matter how you say it – that’s what this whole thing (aka. LIFE) is really about…. All the time we spend chasing the money, love, health is only for one thing – to FEEL GOOD. So, use the internal GPS you’ve been blessed with. The negative emotion, the trigger, it’s sooo USEFUL in helping guide you to what you really want to create in you life.